UNIVERSITY PARK — Stephanie Jones scored the final four points and No. 14 Maryland pulled out a 69-65 win at Penn State on Sunday, pushing their win streak to 11 games. Penn State called a 30-second timeout with 1:19 to go and tied at 65, but were unable to inbound and the turnover resulted in Jones getting fouled and going to the line for the first time. She made both free throws and, after a Penn State miss, the Terps went deep into the shot clock before Jones scored with 12 seconds remaining. Penn State missed two final shots. 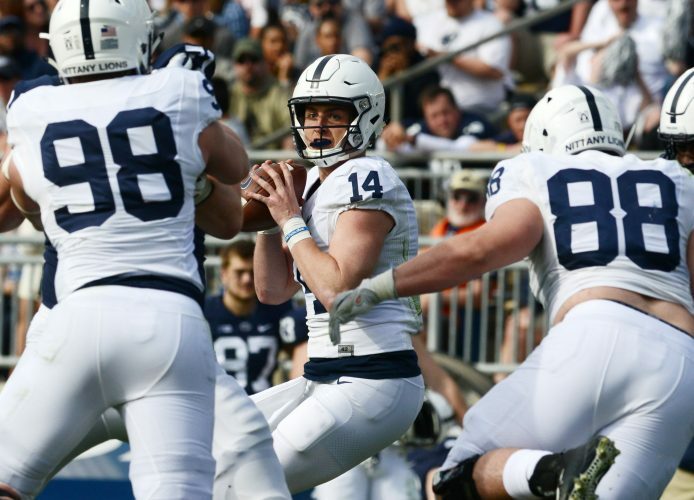 Penn State is winless against Maryland since the Terrapins joined the Big Ten in 2015. Maryland (13-2, 2-0) opened conference play by dropping 100 on Illinois Thursday, but the outcome against Penn State (9-6, 0-2) was in doubt until Jones found her shooting touch in the last minute. Maryland was 4-of-14 shooting in the final quarter. Blair Watson led Maryland with 15 points, Jeisha Small added 14, Brianna Fraser 12 and Kristen Confroy 10. Jones finished with eight points and seven boards. Penn State took a one-point lead into the final quarter, which saw three lead changes and five ties. Jaiden Travascio-Green scored 23 points — her second career 20-point game — for upset-minded Penn State and Amari Carter added 15. MARYLAND (13-2): Jones 3-5 2-2 8, Charles 1-11 1-2 3, Confroy 3-8 2-2 10, Lewis 1-3 0-0 2, Watson 5-8 0-0 15, Fraser 4-10 4-6 12, Christinaki 1-7 1-2 3, Myers 1-1 0-0 2, Small 5-16 4-5 14, Totals 24-69 14-19 69. PENN ST. (9-6): Boykin 3-7 0-2 6, Williams 2-4 0-0 4, Carter 6-14 3-4 15, Page 3-16 3-4 9, Travascio-Green 8-13 0-0 21, Smith 2-3 1-2 5, Frazier 0-3 2-2 2, McDaniel 1-3 0-0 3, Totals 25-63 9-14 65. 3-Point Goals–Maryland 7-15 (Confroy 2-4, Watson 5-8, Christinaki 0-3), Penn St. 6-14 (Carter 0-1, Page 0-3, Travascio-Green 5-8, McDaniel 1-2). Assists–Maryland 15 (Charles 4), Penn St. 13 (Page 4). Fouled Out–None. Rebounds–Maryland 50 (Charles 11), Penn St. 38 (Boykin 9). Total Fouls–Maryland 20, Penn St. 19. A–2,612.